Crowns are one of the most utilized dental treatments in existence. At Weldon General & Cosmetic Dentistry, we are committed to educating the residents of Ocala and surrounding areas with dental education. As a result, we have provided some information about crowns below. A crown is a tooth-shaped cap made of metal, ceramic, or a combination of the two that is placed over the prepared tooth to restore its optimal form and function. The result is a replacement tooth that looks and feels just like the natural tooth. 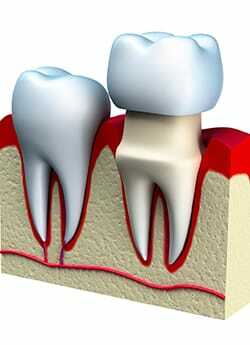 A crown is cemented into place and covers the entirety of the tooth that appears above the gum line. A tooth requires preparation prior to the placement of a crown. The dentist will gently file down the tooth to make room for the crown. If there is not enough natural tooth structure left, a buildup will often be required to create a solid foundation for the crown. If the crown requires two visits to be completed, a temporary cap can be fashioned to maintain esthetics and function. The dentist will then cement the permanent crown onto the tooth. The result looks just like a healthy natural tooth. Weldon Dentistry also provides dental implants when the tooth is missing or cannot be salvaged.